Dental crowns and fillings are common restorative dental treatments designed to strengthen a tooth, improve functionality, and enhance your smile. While these treatments serve similar purposes, they have different applications depending on the damage to the tooth. Dr. Kenneth W. Coffey, a skilled dentist practicing in Orland Park, IL, can evaluate your tooth and determine which treatment, dental crowns vs. fillings, is right for you. Read on to learn more about these effective dental treatments. When Would I Need a Dental Filling? A dental filling is the tried and true treatment for minor to moderate dental decay. Most small to medium-sized cavities are treated with a dental filling. What Is a Dental Filling Procedure Like? After your tooth is treated, and the infected tissue removed, a composite tooth-colored resin will be placed into the recess of the tooth. Filling the tooth with this material serves the dual purpose of strengthening the weakened tooth and sealing the opening to prevent further infection. Because the resin is color-matched to your tooth, the filling will blend in seamlessly. Fillings are typically placed in one appointment. A dental crown is a more comprehensive treatment than a dental filling. A dental crown is sometimes called a cap because this restoration completely encircles a tooth and rests over it like a cap. Patients with extensive dental decay or damage may need a dental crown. Placing a dental crown is also the final step in a root canal treatment. 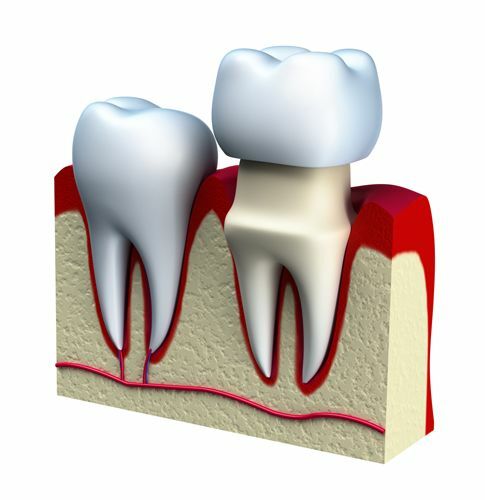 Dental crowns are also placed on the two teeth adjacent to a gap in the smile during a traditional bridge procedure. What Is Dental Crown Placement Like? Before a crown is placed, the affected tooth will first be reduced and reshaped to accommodate the crown. If there has been an infection, the affected tissue will need to be removed. In the case of a root canal procedure, the inner chamber of the tooth will be filled with a composite resin so infection-causing bacteria cannot enter. After the tooth is prepped, impressions will be taken of the tooth. This information is sent to a dental laboratory where your crown will be fabricated to match the shape and shade of your natural teeth. Once the crown is ready, about two weeks later, you will return to our office to have it placed. At this time, your dentist will ensure that the crown fits in with your natural bite patterns, and make any necessary adjustments. Finally, your crown will be cemented into place. Preparing the tooth for a dental filling preserves more of your natural tooth structure, compared to prepping a tooth for dental crown placement. The dentist will take the most conservative approach to restoring your tooth and preventing damage. If you have a damaged tooth that needs a filling or a dental crown, do not delay in receiving the care you need. You can call our office today at (708) 403-7888 or fill out our online form.